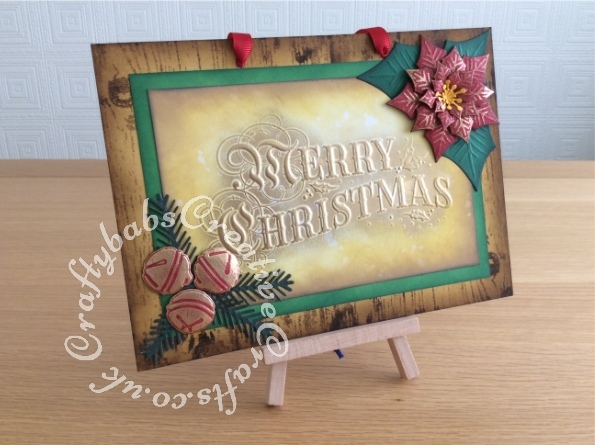 Christmas Card Plaque made using Mount board, inked with various Tim Holtz Distress and distress oxide inks through Minc Woodgrain Art Screen. Main panel inked with various Tim Holtz distress and distress oxide inks, embossed with Crafters companion Gemini 5″ x 7″ 3D Embossing Folder – Merry Christmas and pebeo gilding wax applied. Embellishments die cut using SPELLBINDERS Shapeabilities LAYERED POINSETTIA 7 DIES S5-055, Spellbinders ribbon & bells die set and unknown brand pine needles dies, embellished with Pebeo gilding wax.